Welcome back to another episode of the Art of Business English. 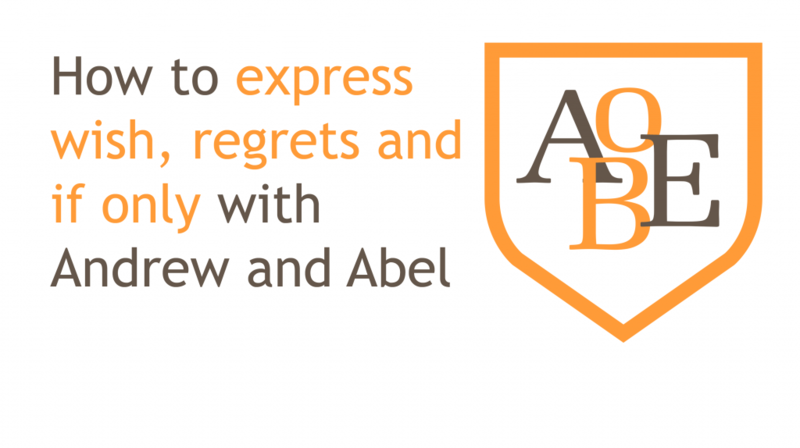 This week I am joined by my colleague Abel as we discuss how to you wishes and regrets in English. In this interview, we cover the four main uses of wish and how they share similarities with the conditional tenses. If you have ever struggled to understand the correct use of wishes and regrets in English then you are going to love today’s episode. Hi there, Andrew Ambrosius. Welcome to another episode of The Art of Business English. Now, I’m here again joined with my colleague Abel, helping us today talking about wishes and regrets in English. So, basically the focus of today’s episode, we’ll be on the four areas of talking about wishes and regrets in English. If you don’t know what wishes and regrets are, well basically a wish is a desire in Spanish ojalá. And regret is to … something that you regret which would be lamentar in Spanish. So, we’re going to be focusing on the four ways that you can use wishes and regrets in English. Abel is quite versed in explaining grammar. He is a grammar specialist here at The Art of Business English. So, I’m going to get him to help explained today the four uses of wishes and regrets. And as always, this episode, we just chucked the camera up. We haven’t really rehearsed or anything, so bear with us as we do our best to explain this as easy as possible. Now Abel, how are you buddy? Good to have you here. Good. Thank you. It’s my pleasure. Yeah, it’s always good to have you back again. So, basically, we’re going to be looking at the four areas of wishes and regrets. They’re, obviously infinitives, so wish plus infinitive. There is wish plus the simple past, wish plus the past perfect, and wish plus conditional. Okay. So, you can use that in a formal context [crosstalk 00:02:43]. Yeah, especially in writing. Imagine that you had a meeting for example, and that you wouldn’t be able to attend that meeting. So, you could like email, for example, the chairman or your manager saying, “Okay, that you can’t do it.” So, in a formal way you could proceed saying, I wish to inform you of my absence tomorrow for instance. Plus, infinitive. I mean, I’ve seen it as well, you could use it in formal communication with your clients as well? Like for example, if you want them to deliver someone some bad news, you could say, “I wish to inform you that your contract has been cancelled.” Would that work? Yeah, you can do that actually. But usually we use regrets in this context. [crosstalk 00:03:40]. “I regret to inform you,” for example, of something, it means that you’re going to give some bad news. And you need to use, of course regret plus the infinitive, because in English you need to know that we use regret plus the ing form as well. And usually we use regret plays the ing form, when we talk about something that is okay. Parts of the past, if I say for example, “I regret giving you bad news.” It means that I have already given you bad news and now I regret that. Okay. So, regret with gerund would be in the past? Okay, excellent. So, the first one is wish plus infinitive for you to say, “I would like or I desire.” In a formal way, usually written? Regret is used in the same way with infinitive to give bad news. To give bad news. I mean for the future. And now it’s something that you haven’t said and regret plays the ing form to, feel sorry for what you have said. Or what you have done. Okay. I think that’s clear. Yes, because here we can use both structures. We can use wish or if only and the meeting is the same. So, how would you translate ‘If only’ into Spanish? Yeah. For example, “I wish I knew how to use a computer.” Meaning that I don’t know how to use a computer and I would like to learn how to use it. We can use ojalá, ojalá pudiera. I think it’s important to note that this simple past, wish plus the simple past in Spanish, you would use the subjunctive following the subjunctive form. So, you would say, ojalá fuera. So, it’s important to remember for our listeners that we tell them that, I think they need to be aware that the subjunctive form doesn’t exist in English. So, it needs to be careful not to confuse tenses or when you see a subjunctive. So, here it’s very important that you know the rule. If you’re using a wish plus simple past, you need to make sure you use a simple past and it means this. So, how do we use it? What is it for? Yeah, sort of most commonly known. Yeah, that’s right. The thing is, you need to know that the form of the verb to be, in this structure of wish plus past simple, is to be where all the time and for all persons, for I, you, he, et cetera. Better not. I would say the more correct form is, “I wish I were,” actually. Yes, because that is not the real past. It’s true that when students get introduced to this structure, okay, they see wish plus past simple. But actually, the past simple refers to something that sauce it and completely finished in the past. And here we are talking about a situation that hasn’t taken place at all. It’s actually syntactically speaking; the correct word is unreal past and not past simple. So, unreal past would be with were. And real past would be with was. Okay. But in practice we can use both now? Okay. So, there you go. If you want to be syntactically, correct. You would use, “I wish, I were rich.” However, in everyday English we would hear, “I wish I was rich as well.” So, it’s up to the individual to use it how they want, the most important thing is that we are clear about the distinction between a wish plus infinitive and a wish plus simple past. Okay. So, the first one a wish plus infinitive is, ‘I would like.’ So you’re using in formal communication, normally written communication. I wish plus simple past is to express a desire in the present and into the future. But it’s a desire about a hypothetical situation because it hasn’t happened, it doesn’t exist, it’s just an Invented or imagined desired outcome or desired reality. Okay? Andrew: What then is the third use? Abel: The third usage is ‘a wish' or ‘if only' plus the past perfect. And actually, we use the structure when we talk about expressing regrets. Andrew: Okay and regrets [crosstalk 00:09:32]. Andrew: Okay. So, let's just clarify then for people that the past perfect. So wish plus past perfect. How do we form the past perfect structure? Abel: Well, the past perfect structure is simple. Okay. We put the auxiliary have in the past simple [crosstalk 00:10:30] and then we keep, yes, had in the past simple. And then we keep the past participle of the main verb. Andrew: So, it's always had plus the past participle of a main verb? Andrew: So, had gone, had been, had spoken. Abel: Yes. And of course, as students know, the past participle is always in third common. Andrew: Third common of the irregular, if you're looking irregular verbs. Remember if they are irregular verbs, then the simple past and the past participle are the same always finishing in ed. However, if there are irregular verbs, then you're going to have to memorize them, because the second column, the simple past may be different from the past participle form. Okay, so you've got run, ran, run. For example, that's in a regular verb. Whereas walk would be walk, walked, walked, because that's a regular verb, so both the simple past and the past participle of the same. Andrew: So, basically then we understand that wish plus had plus the third column or the past participle form of a verb. So that is then talking about something we regret. Abel: Yes. Regrets about the past. Andrew: I think we have to make sure it's clear that people understand that the action happened, yes, but when we talk about it, we're reflecting back to that time in the past and then we're expressing an old alternative desire. We're saying, “I wish I hadn't done that, or I wish I had,” remembered you can use it both in the affirmative or the negative. “I wish I had woken up earlier.” You're expressing a desire to have woken up early in the past, however you didn’t, and you can't change it, so you regret being late to work. But it can also work in the negative. Andrew: Now, “I wish I hadn't gone to bed at three o'clock in the morning, because now I'm very tired. [crosstalk 00:12:38] You can say I wish I had, or I wish I hadn't. Okay, so that is pretty straightforward, isn't structured is the same? Andrew: In Spanish you'd translate that with the subjunctive as well. Wouldn't even say, [Spanish 00:12:52]. Yeah. So, I guess it's important that you wouldn't say, [Spanish 00:12:56]. Andrew: The past perfect in Spanish is [Spanish 00:12:59]. So, you wouldn't say, “había,” in English we use the had because as I said earlier, there is no subjunctive form in English, so we're just using different tenses depending on which structure we're talking about. Andrew: So here it's very important to remember it's always had plus the third column or the past participle form of the verb. Okay. And that's, we're talking about past regrets. Okay. So we've covered three now. Covered the infinity, which is for desire. Abel: The infinitive for being formal. Andrew: Being formal. Informal situations, expressing something formally reducing written communication, where in the simple past which is a desire for something to happen, which has not happened, and we'd like it to happen now or into the future. Abel: Or into the future. Abel: Exactly. But that is impossible, so we are just expressing regrets. Andrew: Exactly, just expressing regrets. Abel: Okay. What's the, what's the fourth form? Andrew: The fourth form is the structure wish plus would. Abel: Wish plus would, so would, I'm going to say would we're meaning like the conditional. Andrew: Yes, exactly. So, I would go is iría. Abel: So, to be more precise here, okay, the structure is always “wish” plus a subject, plus would, plus the infinitive. Andrew: Okay. So, wish plus subject. So, I plus subject as wish. Abel: No, wish first plus subject, plus would, plus the infinitive. Why subject here? Okay. Because actually we need to have two different subjects. Andrew: Okay. So, one second. When you say the second ... Okay, I think we need just clarify that. The first subject, is I? Abel: Yeah, for instance. Yes. Andrew: And then the second time is a subject pronoun, a pronoun. Abel: It has to be different subject, otherwise we wouldn't be able to use this structure. Andrew: Okay. So, we've got subject plus would, plus another subject. Andrew: But what form does that subject take? Is that the object pronoun after verb? Abel: No, not the subject. Andrew: Actually, can it be I wish you? Andrew: Can it be I wish he? Andrew: Okay, so it's not I wish him? Abel: It's one of the requirements for the use of this structure. Otherwise, it wouldn't be possible to use this structure if we were to use only one subject for the same subject. Abel: Subject one, I would say. Abel: Plus, would, plus subject two. Andrew: And the structure or the form ... Sorry. The form of subject to is I [inaudible 00:15:45]. Andrew: It's not him, her. Abel: No, it shouldn't be one. Yeah. It should be a personal pronoun. So it's not like this ... Okay. It's not an object pronoun after a verb. No, it should be a personal pronoun. Andrew: Like I will call her. Abel: No, it's like this. No, not ready yet. Abel: Okay. I just wanted to clarify that for the audience. So, we use this structure when we talk about annoyance or we talk about a behaviour that we disapprove. Andrew: So, we use it for annoyance or expressing frustration and behaviour we do not approve of. Abel: And that you complain about. You complaint about a behaviour actually that you disapprove. Andrew: Okay. So subject one plus would, plus subject two, plus? Abel: Yeah, and the bare infinitive. Abel: Absolutely. Because any verb that follows a modal verb must be in the bare infinitive.